I’m still processing everything that I’ve heard about what happened to Tom, but it’s been really nice to dig through old videos and remember all of the good times back East. I’ve tried to compile everything I have from those years, plus some other videos that I associate with our crew when I was out there. That part of New England has an incredible riding scene that was so inclusive when I showed up. Tom was one of the guys I got to know the best. He was really thoughtful and mature for a kid his age, and bmx wise he was an incredible talent. live from woodward from no bikes on Vimeo. “Live from Woodward” was a little day edit that we made when everyone else went to Woodward and Tom and I stayed in Broad Brook. We lived in the same little town and this was the only time I ever hung out and rode his ramps. It was super fun and not very serious. Probably as much fun as going to Woodward. tom extras 2 from no bikes on Vimeo. These were actually extra clips from Tom’s Fat Trax part. We filmed so much stuff that clips this good didn’t even make it in Matt’s final edit of Tom’s part. It’s probably my favorite collection of riding clips of Tom; the riding is great and I love clips with no music. tom extras from no bikes on Vimeo. And this was another full extra edit we put together from Fat Trax clips that mostly didn’t get used. Tom was a whip to frame guy forever and I think it only bugged him right before he learned them to pedals. It was a funny thing that he did and I always told him he should do it forever just because nobody was ever going to question how good he was based on that. Tom in the Fat-Trax DVD from matthorak on Vimeo. This is Tom’s actual part from the Fat Trax video, put together by Matt Horak. The last section in a video full of great sections. gmp serious bangers from no bikes on Vimeo. Tom grew up riding with the kids from Enfield and GMP was their local park. Never in the history of skateparks has such a basic, run down old pile of metal gotten as much mileage as these dudes put on this little park. I stopped by the park a few days after work to get the most serious bangers possible, but mostly I just wanted a little record that this place existed and a picture of what it was like. Tom Kalmanidis from matthorak on Vimeo. Tom’s part after he got on Hoffman flow. He was a big fan of Seth Kimbrough and rode a lot of Hoffman stuff even though it wasn’t a super core brand. I think this was a pretty meaningful thing for him and he was stoked when it happened. Rhode Island Day Trip from matthorak on Vimeo. This was one of my favorite edits that the guys put together when I was out there, just because it was pretty much what we always did. That area has so many cities so close together that it’s easy to pack up a car and go to a different one every weekend. We did that a lot. These trips were where I got to know Tom well. Rays MTB from matthorak on Vimeo. This trip to Ray’s was so nuts. Not even for the riding – the actual trip there was insane. For some reason the guys got the idea that we should leave for Cleveland at 9 pm. From Springfield. It’s a nine hour drive. Tom was my copilot and we managed to keep each other awake pretty late. We didn’t actually go all the way to Cleveland (I have reasonable judgement and we stopped when we needed to), but it was a memorable night hanging out. No Bikes/Fat Trax in Oregon from Least Most on Vimeo. The last time I saw Tom was in 2011 when he came out to the NW for a no bikes trip. It was a really good trip – everyone was amazed by Tom’s ability on a bike and he connected with lots of people in this part of the country. We spent a few days in Seattle, a couple in Portland, and then finished up with a beach fire out on the Oregon Coast. It’s a sad thing, what happened to Tom, but I’m so thankful I got to know him and had the privilege of lugging a camera around after him for those years. This reminds me of older times. Nate rules! Gabe sent this over. I’ll be posting again in the summer, but for now I’m just working a lot. I am driving across America for the second time, this time with my wife, son, Tony Archibeque, and eventually our friend Gary. 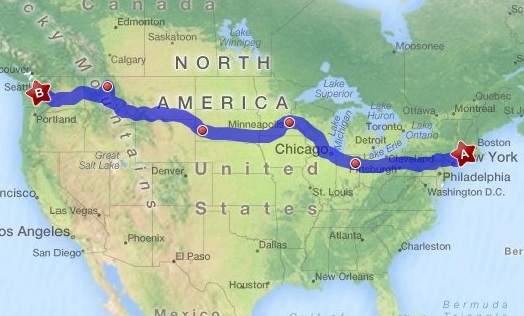 Our route is undecided, although we have planned stops for Fort Wayne, Minneapolis, and Whitefish, MT. Today’s events really began on Wednesday, when I discovered at the Uhaul place that someone had removed the wiring for trailer lights from my truck. I ended up next door at what Tony initially decided was a chop shop, but it was relly just a bunch of Puerto Rican dudes who fixed semi trucks. That leads us to today, when their sketchy wiring job blew the circuit for the brake lights and my truck wouldn’t get out of park. In the parking lot of a hotel with a waterpark. Tony and I waterslid our faces off for an hour before retiring. Unfortunately, I don’t have any photos for today because the camera is still in the truck. The one thing this blog is missing is waterslide action photos. Back by request. We’re picking up and moving to Seattle in a week. In the meantime, here’s our first big trip to Seattle, and it’s still an awesome video.